This product is no longer available. Please contact MarComm@naccho.org with additional questions. This interactive CD is targeted to public health and healthcare professionals. It is organized along two basic learning tracks starting with the basics of radiation and toxicology, followed by the role of public health in radiological disasters and more detailed training on radiological and chemical incidents. All-hazards modules introducing mass triage, decontamination, and the use of personal protective equipment are also included. 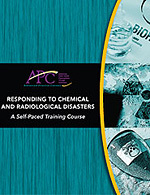 The CD contains supplemental videos and additional training resources from the CDC and OSHA. Limit 25 per customer.